Well, here’s the moment where I have to admit that I’ve never seen this movie before. 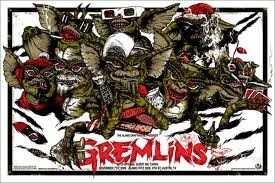 I know, I know, it’s a classic and I must never have had a quality childhood without seeing “Gremlins” when I was a kid. I also didn’t see “The Goonies” for the first time until last year so go to town on that one too. 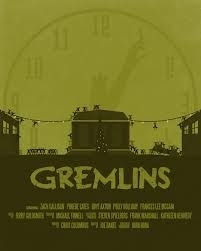 I swear I saw a lot of “classic” films when I was a kid, I just never got around to seeing these ones. I saw “Memphis Belle” like 3 times though, that’s gotta count for something. Anyway, by this point you must know the plot to this one by heart. 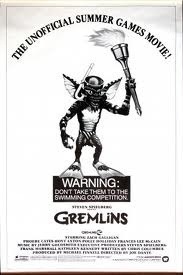 That band Mogwai named themselves after that cute little creature on the poster, who was given as a Christmas gift but with strict rules. 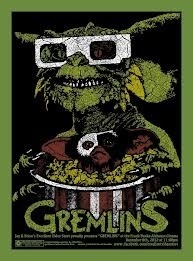 Never get him wet or feed him after midnight. 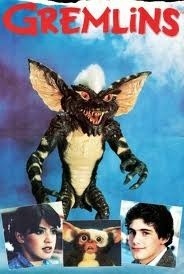 Both of these things happen and an army of “gremlins” are unleashed upon the nation. Can they be stopped ?! Where did they come from ? Are they basically just Ewoks in some ways ? This one has a lot of talent behind it. 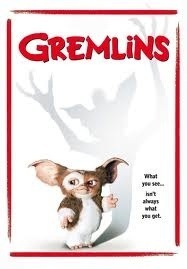 Directed by Joe Dante (Piranha, The Howling), Produced by Steven Spielberg (1941, Hook), Written by Chris Columbus (The Goonies, Home Alone), Music by Jerry Goldsmith (Planet of the Apes, The Omen) and Starring Corey Feldman, Phoebe Cates, Judge Reinhold and the voice of Howie Mandel ! 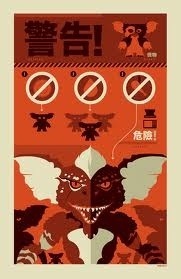 As the Mogwai. It’s weird, he’s sort of doing a version of his “Bobby’s World” character. It’s not that there’s anything “wrong” with the movie, far from it. I think I would have loved this as an 8-10 year old. 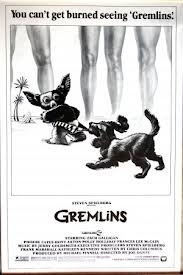 I really couldn’t shake the similarities between the Gremlins jokey kid-speak and the Ewoks. It was all very cutesy and frankly kind of annoying at times. 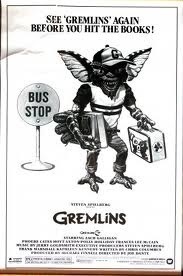 It’s funny to learn about Howie Mandel voicing Gizmo after the fact, it makes a lot of sense. Suffice it to say, at 30 this movie just doesn’t have the appeal to someone coming in fresh. I realize I’m in the minority here but considering the hype and talent involved I found this to be a letdown. 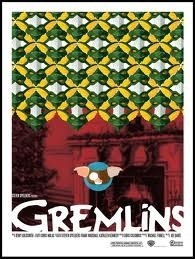 That said, my roommate loved it as a kid and watched it with me and his girlfriend. She didn’t like it either and he admitted it wasn’t as good as he’d remembered. Sometimes a movie like this just doesn’t work when you catch it 20 years too late. 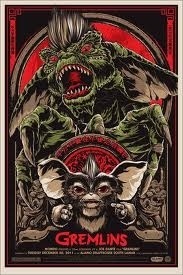 I loved “Labyrinth” as a kid but never saw “The Dark Crystal” (which many people love). I’m afraid that too would be a case of catching the train two decades too late. 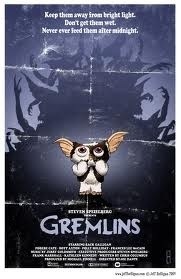 In the end, I respect all of you who love this movie that you loved as a child, but sadly it just didn’t do it for me. 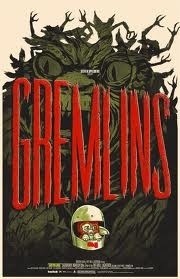 Frankly “The Goonies” was better, just saying. 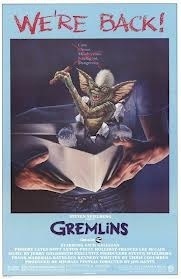 This entry was posted in Reviews and tagged Christmas, classic, cult, Ewok, family, film, gem, gremlins, holidays, Horror, monster, Movie, review, Sci Fi, Spielberg, Xmas by lazron. Bookmark the permalink.